If you can't already tell by the nostalgia rages that often engulf this blog, I'm a fan of classic, 1980's style Warhammer. But there's one issue on which I part company with the canon. 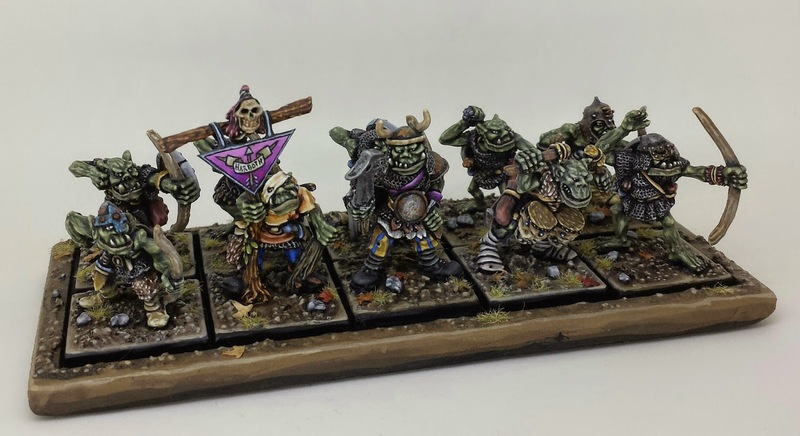 I've never been able to swallow the bright green of traditionally painted orcs. 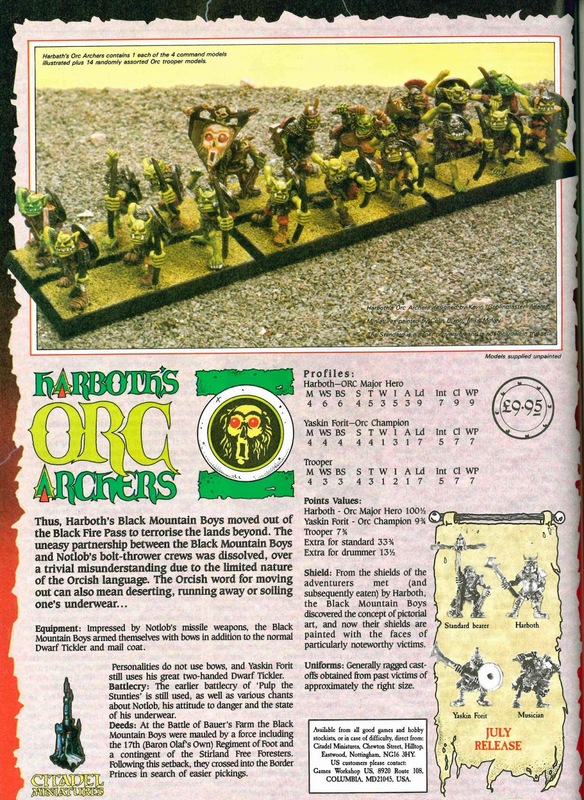 After GW introduced Citadel Inks in 1988, things only got worse -- Eavy Metal began recommending that orcs be glazed in yellow ink, which only added to their glow (see White Dwarf #100 for example). These orcs seemed too goddamn healthy to me, as if they were about to suspend rampaging and try their hand at photosynthesis. 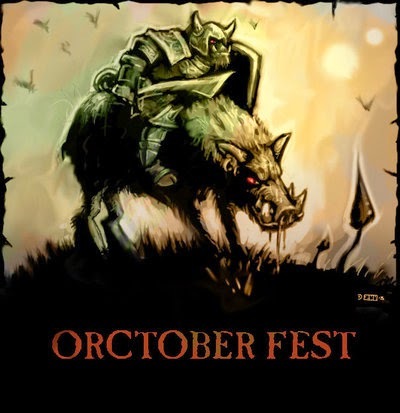 Nope, for me, Orcs should be green, but it should be an unwholesome green -- the colour of a damp rug or a forsaken tub of yogurt. 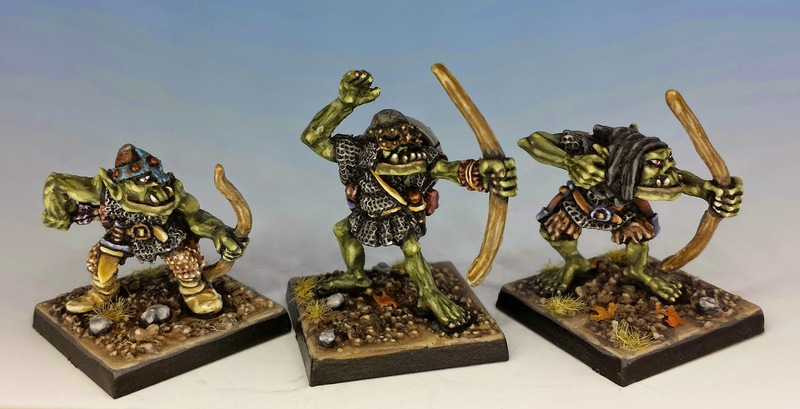 To showcase my pigment of choice, in this Ortober post I'm presenting my rendition of Harboth's Orc Archers, sculpted by Kev "Goblin Master" Adams and released in 1987. Above is the command section. I painted the skin tones in five shades, starting with (the old) GW Catachan Green as the base layer. For the next shade, I added a little GW Rotting Flesh to the mix, and a little more for the next layer, finally working all they way up to 80% Rotting Flesh as the highest of highlights. Another issue I struggle with in orcs is ornamentation. 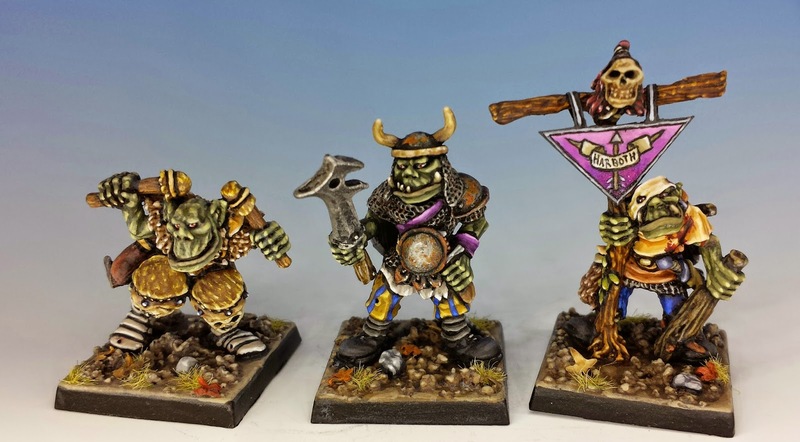 Traditional Games Workshop orcs (especially when painted by the Eavy Metal crew or Kevin Adams himself) often featured bright shields with leering faces of extraordinary artistry. First, I don't have that talent for these embellishments. But second, I think your average goblinoid marauder would spend less time accessorizing and more time eating prisoners. So my orcs tend to be less flashy. The leaders sometimes sport looted gear (like Harboth's striped pants) but in general, their equipment is simple and in bad repair. I try to add interest to the miniature through rust effects and other signs of wear. Their traditional battle cry is "Pulp the stunties!" These orcs look amazing. The wood grain on the shields is a highlight for me and the exceptional bases seal the deal. Jobs a good un! 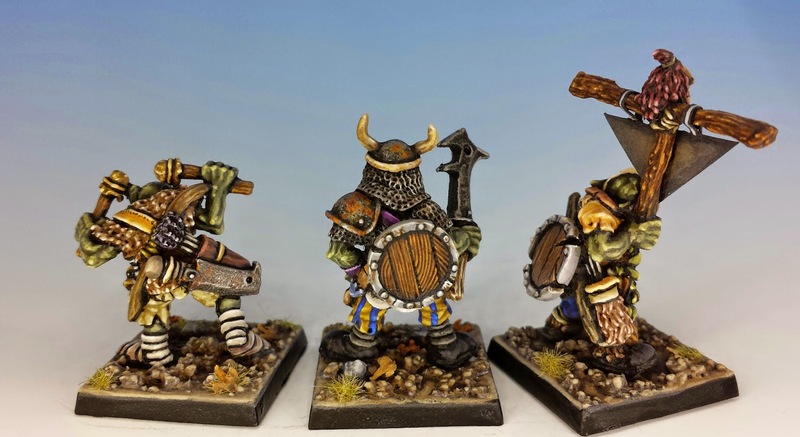 And I agree completely about highly detailed livery & orcs not making sense, it was even worse with the red era orks, my god they were elaborately decked out!! !